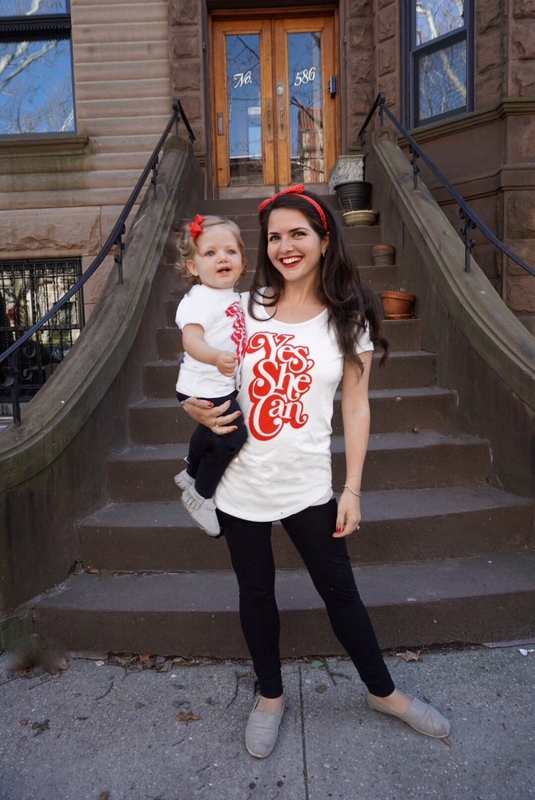 Yes She Can: Celebrating 1 Year of Blogging! Last week marked my one year anniversary of launching my blog Ariel Loves. Blogging was something I had thought about and wanted to do for a long time (I’m talking years!) but was too nervous to do. I follow a lot of blogs and it began to feel like every other person was a “blogger.” I created a narrative in my head that told me I couldn’t do it - “what unique voice could I possibly add to an already-saturated blogosphere?” It's so easy to play the comparison game and get down on ourselves. I let self-doubt get the best of me and put off the idea for a long time. It was easy to make excuses - I was busy with work, moving cities, pregnancy, settling into a new home, and welcoming a newborn. Ironically, I finally took the plunge during one of the busiest seasons of my life - when Adina was 6 months old (how is she 18 months now?!) - and told myself “Yes I can” and launched Ariel Loves. I haven’t looked back since! 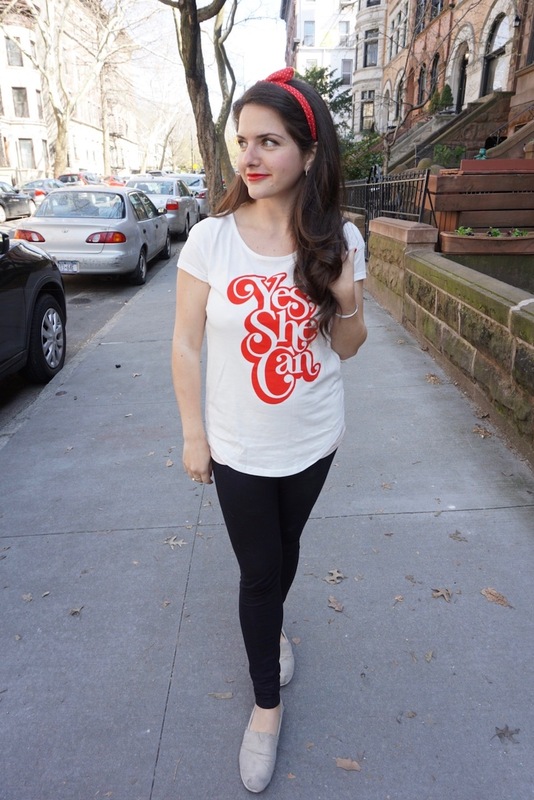 A few weeks ago, Alice from Skylar Yoo kindly sent me these cute t-shirts that say “Yes She Can” on them. Their brand is all about inspiring and empowering women to be bold. Skylar Yoo sells apparel, art prints, and accessories to the modern feminist. I just love the message that Skylar Yoo sends to women - that they can achieve anything. 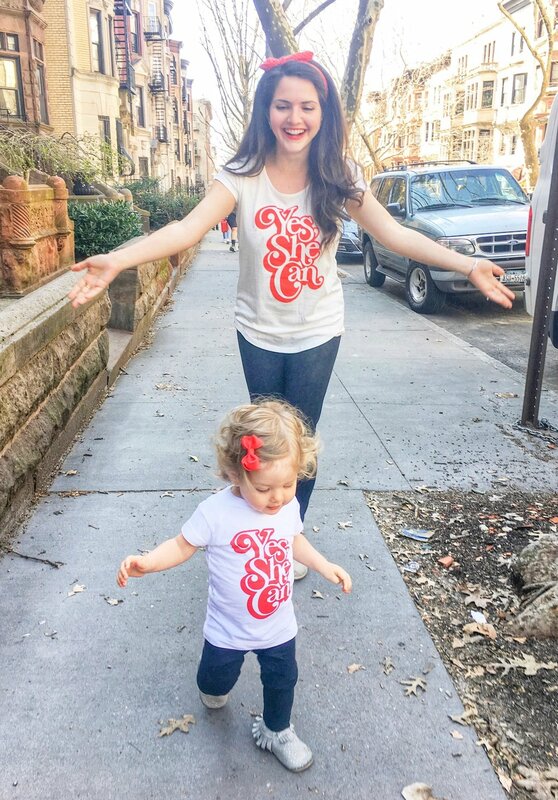 When I saw that they carried toddler and youth sizes too, I knew I had to get matching shirts for Adina and me! 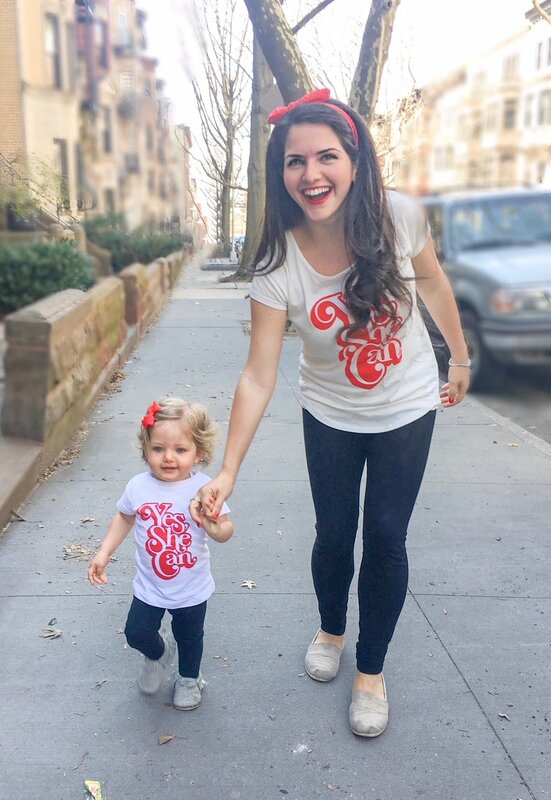 In honor of my one year “blogiversary” coming up, Adina and I took some pictures together in our matching shirts. We have both grown so much in the last year and I wanted to celebrate the growth of this blog and my own growth as a mother. It has finally started to feel more like spring in Brooklyn so we took advantage of the nice weather and snapped some pictures outside in our neighborhood. Adina loves walking (more like running these days) up and down our street and waves to all of our neighbors as they pass. Her favorite thing is saying hi to all of the dogs (there are a lot on my street!) and “woofing” at them. We managed to snap a few cute shots together and then she was ready to run around and play. It’s so hard to photograph toddlers - I feel like I have to take 100 pictures to get 1 good one! You should see the outtakes on my phone - haha! I want to thank all of you for joining me on this ride! Thanks for reading my blog posts, engaging with me on Instagram, Facebook, and Pinterest and sending me such sweet and supportive messages. I hope to start a monthly newsletter where I’ll share new posts, updates, and behind the scenes look at Ariel Loves. You can sign up for that here to join. I don’t know exactly how this blog will evolve over the coming year, but you can be sure that it’s not going anywhere. I’m proof that if you’ve been putting off a goal or an idea for a long time, it’s never too late to take action. You’ve got to start somewhere! Cheers to believing in ourselves! Yes We Can!